This book contains some actual love stories that never ended in marriage. Chocolate: is a story of a hand-worker student who is the child of a widow who falls in love with a school friend. Secret Love: is a story of a young working girl who falls in love with a handsome young physician. First Crush: is a story of a boy who had a crush on his doctor. Kiss: is a story of passion between two college students. Prajwalit is the pen name of the author Dr. Pradip Chauhan. He has earned his M.B.B.S. and M.S. Degree from Saurashtra University, Gujarat and working as Lecturer in the Pandeet Deendayal Upadhyay Medical College, Rajkot, Gujarat. His area of interest is fiction, romance, paranormal, occult, and spiritual writings. He had already published many international research articles in Medicine. He had strong educational background and he has vast reading of Guajarati, Hindi, English literatures. Wonderful, different stories. Not lighthearted but written in different way than the current trend. It is the change for readers who are bored by stereotype love stories and lengthy useless descriptions. Daily life incidences are included in nice manner with explored internal feeling. 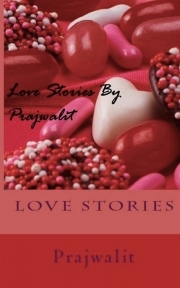 In brief all love stories a enjoyed.....worth reading.